Leaving the Green Mountains of Vermont was one of the more bittersweet moments we had on the northern part of the Appalachian Trail. 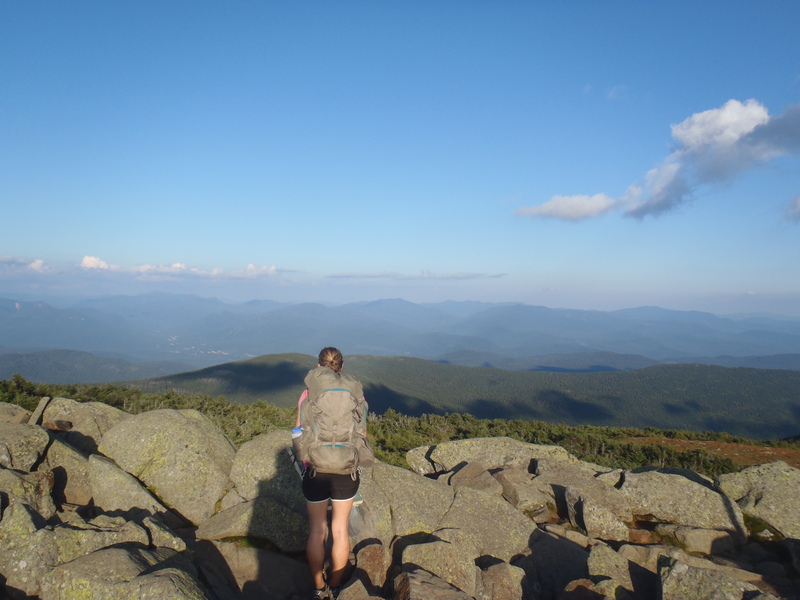 Lindsay and I both looked forward to tackling the looming challenge of the White Mountains partly because of the beauty that the big peaks and ridge lines of New Hampshire held on a clear, sunny day but also so that people would stop talking about how hard they were going to be. 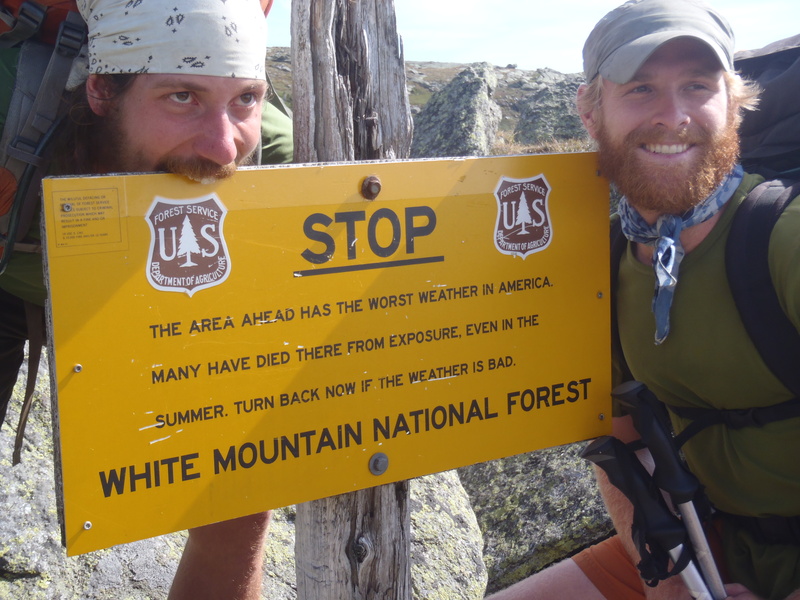 It seemed like “The Whites” produced a near-paralyzing fear for at least 100 miles before the first climb. Considering the fact that a blind man (Bill Irwin) had thru-hiked and people in the 80s thru-hike every year we assumed that some of the anxiety might have been from slightly exaggerated stories and tales. 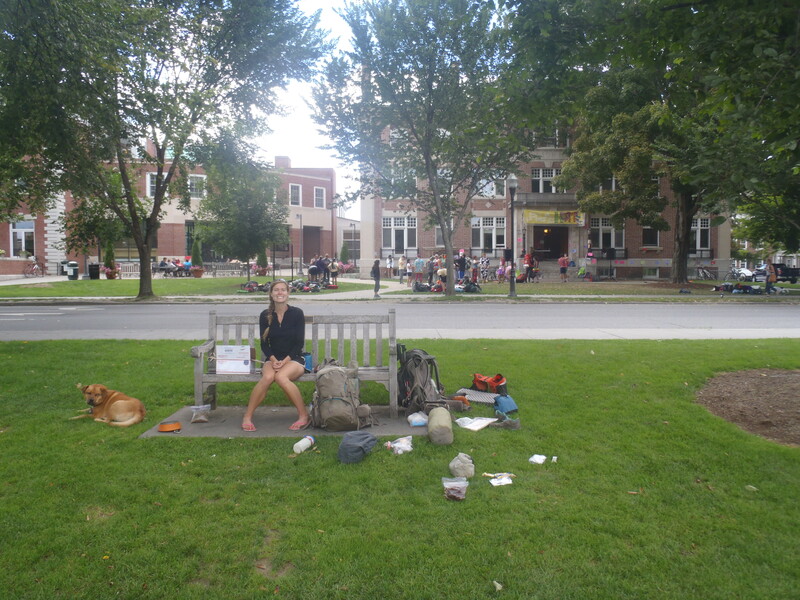 Nonetheless, we decided to err on the side of caution and take a rest day to load up on calories and resupply our food in the beautiful New England town of Hanover, NH. 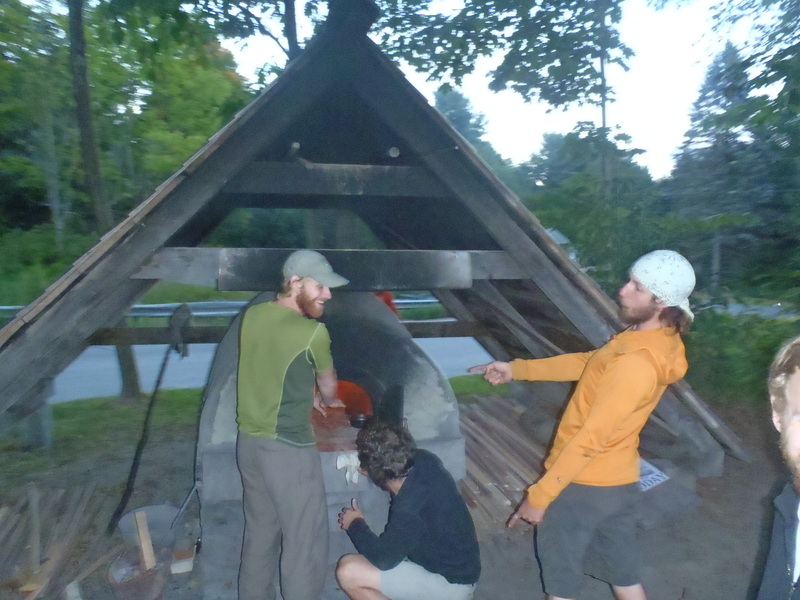 As long as erring on the side of caution is having a self-cooked pizza feast at the community pizza ovens with a case or two of Long Trail Ale then we were very safe in our preparation for embarking on our White Mountain Adventure. 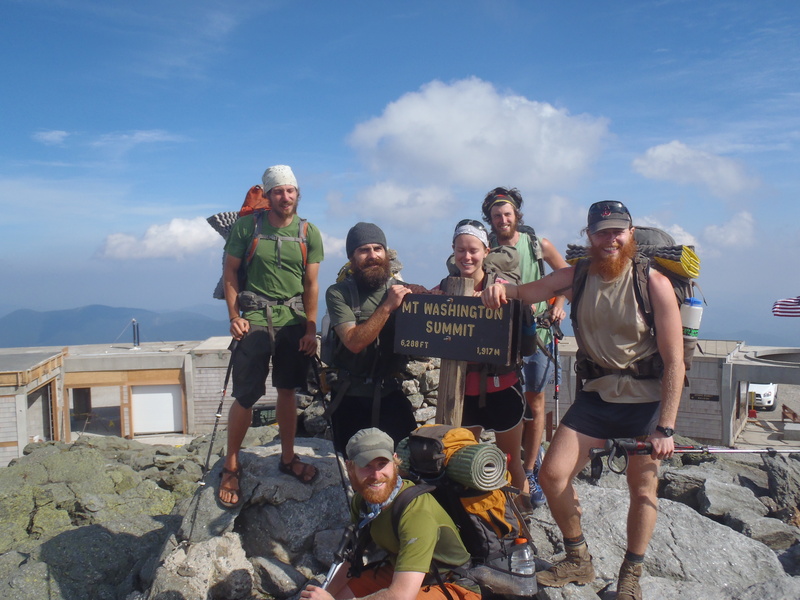 Since the White Mountains officialy started at Mt Moosilauke, 50 miles north on the Appalachian Trail from Hanover, NH, we had to first get to The Whites before we could actually start hiking them. While the two days it took to get there were relatively uneventful we tried to enjoy them as much as possible because they would be our last days hiking with Hunter until we hit Andover, Maine, 150(ish) miles north. 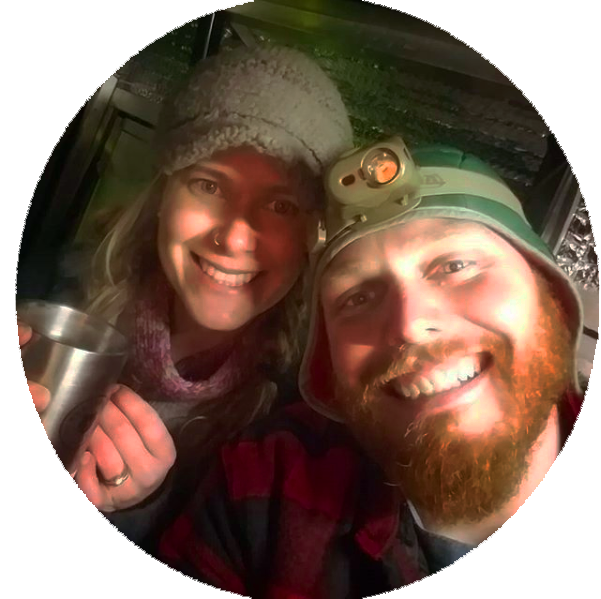 Despite the fact that both of us were confident with Hunter’s ability to deal with the challenging terrain that the upcoming 150 miles presented, sending him home was the safe and smart thing to do. 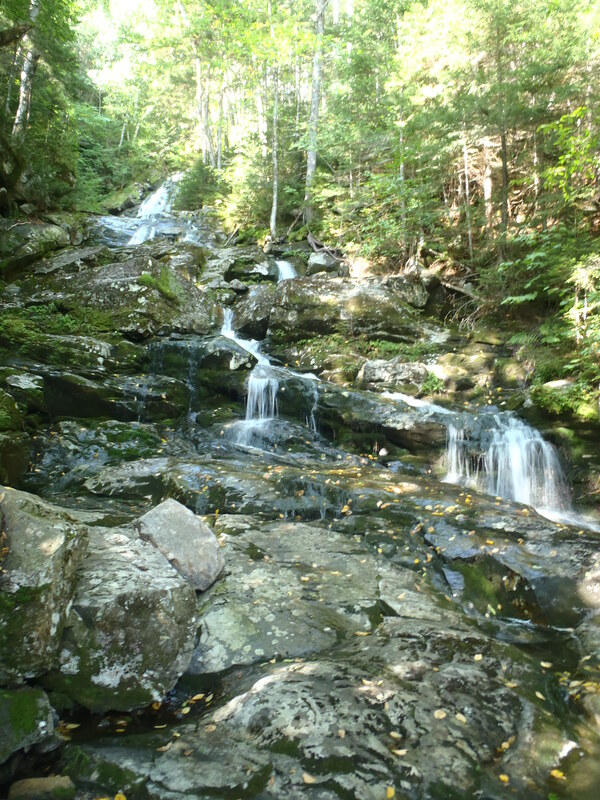 Our vet in Maine had seen too many dogs coming off the AT with torn pads, paws and leg injuries to make hiking that section with him worth it. It only takes on bad leap or slippery rock to get a dog hurt and with the difficult terrain and limited access to roads it seemed like a no-brainer to have hunter take another two week vacation getting fat on the couch! Clay on the PAINFUL and SLIPPERY , 3 hour descent of Moosilauke. Lindsay doing some dishes on a work-for-food while Clay takes photos! As things tend to work out on the trail, you seem to run into long lost friends right at your point of lowest morale. We spent the night at the bottom of Kinsman in our tent, riding out one of the most intense thunder storms we had experienced in months just hoping and praying a tree didn’t fall on us (again) and we could stay dry until morning. The next day we stopped at an Appalachian Mountain Club (AMC) Hut, where vacationing hikers can spend $100+ /night for a bunk, dinner and breakfast, to get a bandage for my wrist and fill our water bottles and stumbled upon Fern Gully and Sunshine sweeping the floor! Well, as it turns out the AMC has a work/food-for-stay program designed to help AT thru hikers at all of their huts, and our friends took advantage of it the night we spent trying not to drown in our tent! The availability and type of work is normally up to the Hut Croo (staff) but more often than not the first couple hikers who stop in after 5pm can sweep some floors, clean some bathrooms and do the dishes in exchange for a floor to sleep on and leftovers from both dinner and breakfast. The AMC has seven evenly spaced huts on the AT and even if we didn’t plan on staying there we still tried to get some food from them! In all honesty, stopping in at 10am and offering to do dishes and sweep a floor in exchange for any of the leftovers in the fridge isn’t too bad of an idea! Our tight schedule, pushing an average of 15 miles/day kept us from spending the night at any of the huts, but the ability to do work for food at almost every hut is honestly what kept me going through The Whites without chewing on tree bark for extra calories. One of the most stressful or beautiful days on the Appalachian Trail occurs in The Whites and is entirely weather dependent. 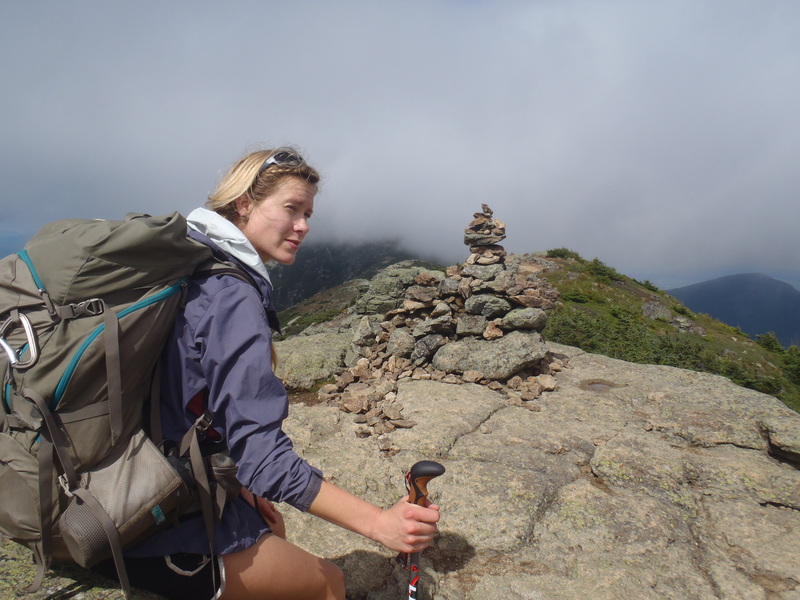 The climax of The Presidential Range is summiting Mt Washington, which is also home to the worst weather on the planet. Knowing that thunderstorms with 50mph(+) winds and accompanying rain were forecasted in the near future, we decided to “sprint through” the Presidential Range. 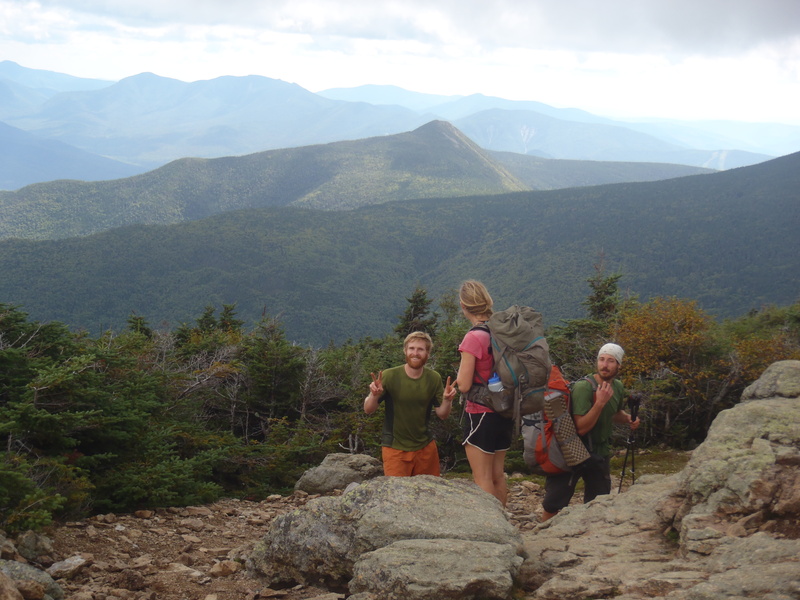 Granted it is 12 miles, 10,000ft total vertical change and some of the more difficult hiking on the entire trail to get from Crawford Notch to the summit of Mt Washington, the term “sprint” needs to be used relatively. Nonetheless, we hit the top by 3pm and met 150 of our closest friends who drove to the top on the beautifully calm and cloudless day the preceded the storm front we could visibly see moving in on us. The dichotomy of thru hikers who had worked for four, or more, months to reach that point at the top After standing in a line of tourists for 20 minutes, after walking 1750 miles from Georgia, to get our picture on the highest peak in New England the time came to make a weather call and scoot down to safety. 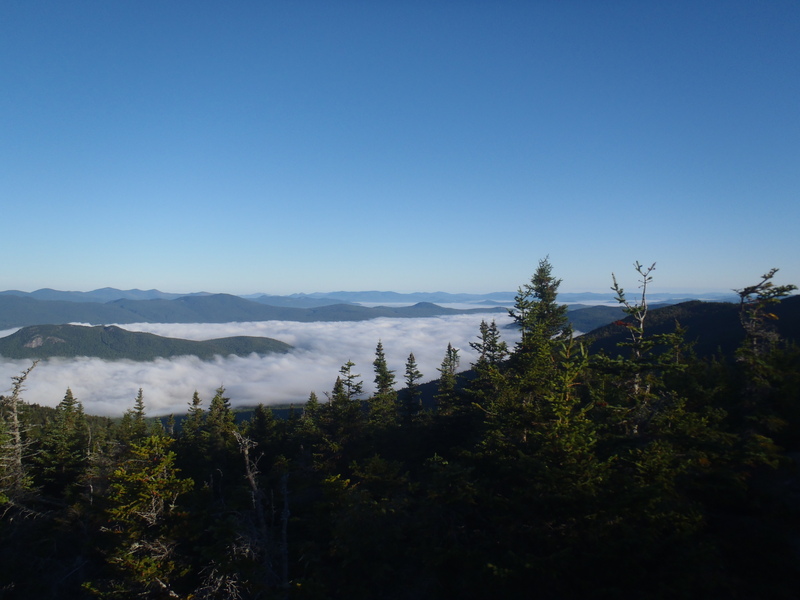 The Appalachian Trail continues along a ridgeline above tree line for another eight miles to Mt Madison before descending to lower elevation with the first possible camping sites a full 12 miles from the summit of Washington. Being late in the day and knowing that thunderstorms sat on the horizon we decided to make a weather call and take a direct 4 mile descent down the mountain on a ‘bad weather’ alternate trail. 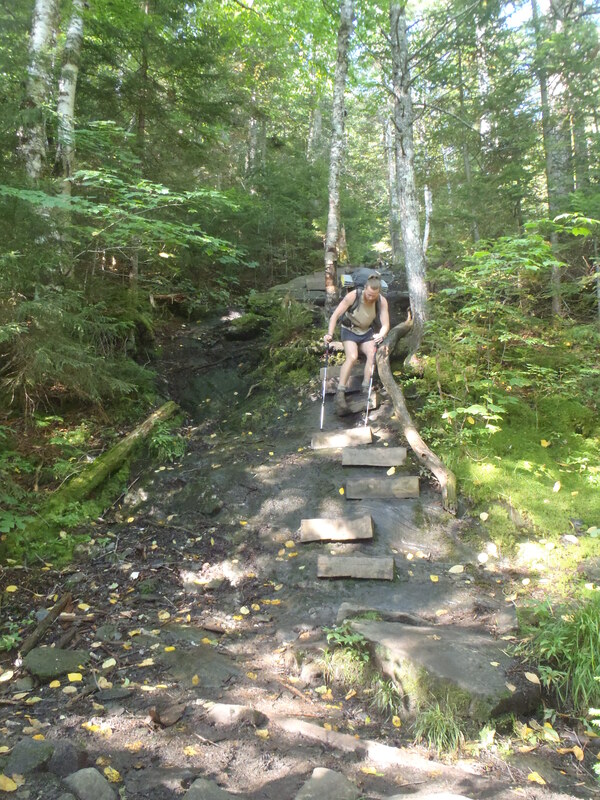 Did we wimp out and “skip” 12 miles of white blaze trail? Yes. Was it the right call because flirting with weather in the White Mountains is a terrible idea? Yes. That’s why they say hike your own hike! 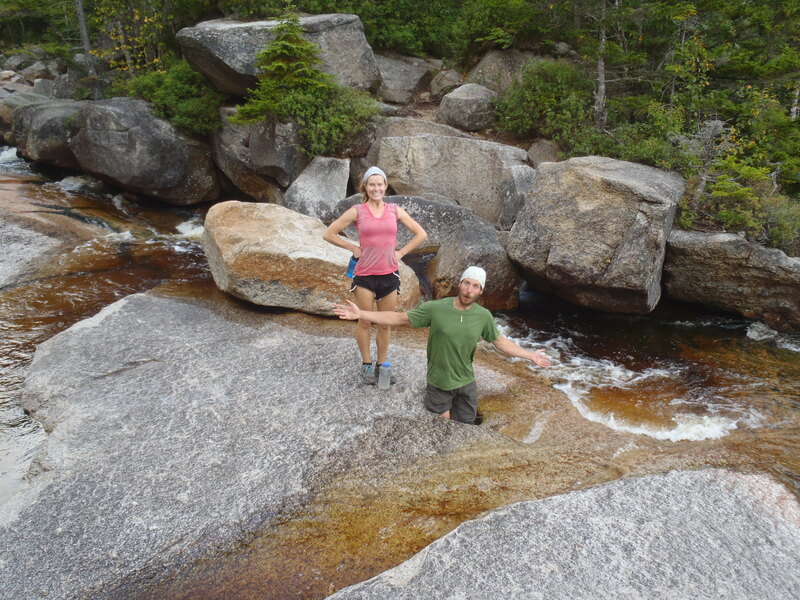 Fern Gully and Sunshine pose on the ascent of Mt Washington… I swear the hike hasn’t made us go crazy! By the time we made it off Washington and took a zero day to sit out the rainstorm we hit the last major section of The Whites, the Wildcat/Carter Mountain section. After conquering Washington at hammering through the Franconia Ridge like it didn’t even exist, we figured that the last 20 miles of our time in the White Mountains would be an easy cruise to Gorham. Well, as we should’ve expected, nothing on the trail is as easy as you would wish and going over the constantly rolling peaks of Wildcat Mountain and Carter Mountain turned out to be one of the most taxing days of our entire hike and we only walked 14 miles at the end of the day! Nonetheless, we walked across the road that leads to Gorham, NH the next day and officially made it out of the White Mountains relatively unscathed and not a lot worse for wear. In the end the views were incredible and between the beautiful weather and incredibly good luck with work-for-food opportunities at the huts we had nothing to complain about with The Whites. Leaving Gorham we were only 40 miles from theMaine/New Hampshire line and our last border crossing but also the looming difficulty of the Mahoosuc Mountains of Maine.